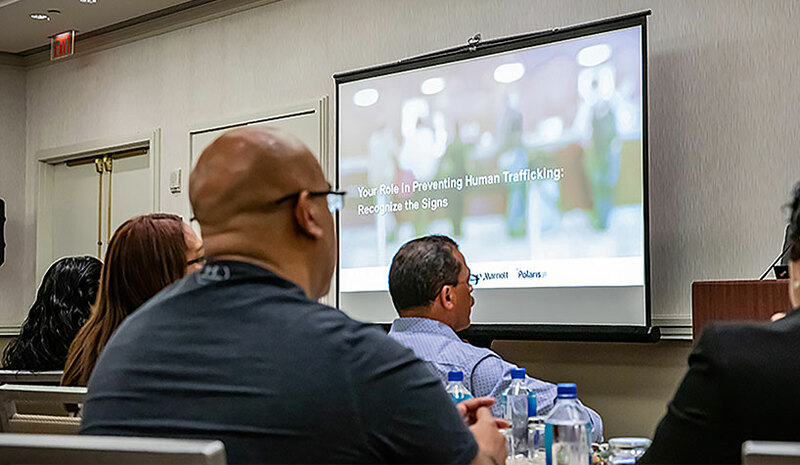 Sheraton Times Square hotel workers learn signs of human trafficking as part of Marriott International’s mandatory awareness training. BETHESDA, MD— As of this month, Marriott International has successfully trained 500,000 hotel workers to spot the signs of human trafficking in its hotels and how to respond if they do, marking a watershed moment in the global fight against this multinational crime. Marriott launched its mandatory human trafficking awareness training program for on-property staff in both managed and franchised properties in January 2017, underscoring ongoing efforts under the company’s sustainability and social impact platform, Serve 360: Doing Good in Every Direction. Guests who suspect trafficking or abuse should not confront the child or adult, but should alert hotel management or security, or dial 911 or their local emergency number for emergency situations. In the U.S., they can contact the National Human Trafficking Hotline at 1-888-373-7888 or text “BeFree” (233733). Next Article What’s Cookin’ in F&B?